Rites of the Aethyr is a solo/split release between UK based Brennendes Gehirn and Canadian Dorian Williamson. Brennendes Gehirn may be known for his Epidemics Of The Modern Age release, while Williamson has been part of Adoran with Aiden Baker. 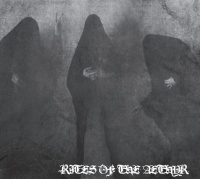 Rites of the Aethyr features one track from each member, as well as one collaborative track. The overall mood of Rites of the Aethyr is droney, with added industrial effects and black metal doom atmospherics. Williamson's solo track 'Involution' tends towards the drone side of things, with a measured and restrained piece where slow lurching bass driven drones carry faint traces of wordless and percussive accompaniment to the cyclic doomy atmospherics. For the most part 'Involution' drifts in a hazy manner but the latter segment piles layers of drone over drone, with the bass more prevalent, before subsiding into hollow droning. Brennendes Gehirn's solo track, 'Geheimnis', is much more ominous and threatening. Over thuds a heavily reverbed female voice lifted from David Lynch's Inland Empire recites some sinister dialogue before slipping into shifting dark cinematic textures with swirling shapes and grating drones. The entire thing is swept up into a high volume miasma of glistening effects swinging between screech and moan. With no obvious rhythmic qualities a sense of beat is (forced and) formed from breathy structures. 'Geheimnis' offers a sense of tension which is also surprisingly hypnotic. The collaborative title track, 'Rites of the Aethyr', the shortest of the pieces here, opens to churning grainy textures with the voice of the Great Beast, Aleister Crowley, reciting Enochian chants culled from age-old wax cylinder recordings over passages of eastern percussion. Crowley's voice appears and disappears throughout as it rides through ripping tones and churning drones alongside hand played percussive beats before being sucked up into layers of noise infused drones. Propelled by those eastern rhythms, Williamson's repetitive bass drone and Gehirn's industrial electronics feed into a dreamy, distorted thick wall of blackened atmospherics.